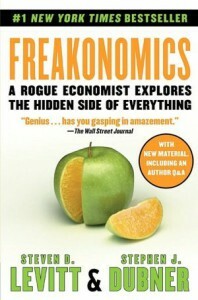 One of the most interesting topics in Freakonomics, is that of bad assumptions in causality. These are made when people consider causality regarding a particular event, and they making assumptions that are affected by factors such as self-interest, prejudice, common sense, etc. The book shows that when the right questions are asked and their answers are searched in a bigger context, some unrelated causes may happen to trigger the original event. An example from the book is how crime rate had fallen in the US during the mid-90’s after years of increasing and contrary to the most predictions. The authors noted that legalizing abortion in 1973, which is totally unrelated to crime, is what mainly led to the fall in crime rate. They argue that most unwanted children who are most likely to have criminal tendencies, were not born anymore because of the said legalization. Most people would assume that crime rate had fallen because of the strong economy or because of new police strategies or whatever. But when you look at the bigger picture, the real chain of events may begin to materialize. The book helps knowing how to differentiate good assumptions from the bad ones. A very helpful tool in this is the study of incentives. People respond to anything according to their incentives. An incentive can range from money to something as vague as inner peace. In the previous example, treasury people will want to believe that a strong economy helped bringing crime rates down. The police chief will most likely convince himself and other people that his new police strategies are the major contributor to the fall. Some may think that God intervened and helped. This may seem a very simple idea, but when it comes to everyday life, everyone’s incentive is not that clear. An example to this is that of real estate agents. The book demonstrates how real-estate agents will in all likelihood convince you to sell your house at a price that they would not approve if they were themselves the owners of your house. Their explanation is quite simple and plausible: When you're the owner of the house, an increase of 10000$ means a mere couple of hundred dollars for the agent, whereas that is not the case when the agent is the owner. I’m not an expert in the field, but I believe that statistical analysis and its implications are not always applicable on the individual level because it cannot make cut and dry conclusions, and we don't like that individually. Maybe it can help us be more observant, but that has significant side effects, with the most probable one being confusion. The authors claim that the book will help people individually, but I think it can be of much help to corporations or groups. Another problem I've realized is the correlation of data, which may lead to contradicting outcomes as happened in this very book. In one study, the authors show that parents with high income are most likely to raise a successful kid. Yet, in another study near the end of the book they show that the parents’ economic status does not affect their child’s success in life at all, since other factors may be at play. I know that in statistics, it is very natural that individual cases may contradict with one another which is something inherent in the nature of statistics, but when entire statistical outcomes contradict, I think the method used can fairly be deemed inefficient. This was much more enjoyable than reliable, except for the last chapter about names which I believe was a total waste of time. I think that rather than providing anything new, the book is a practical training about a much older wisdom, the maxim of Cassius, which was quoted by Cicero: Cui bono?